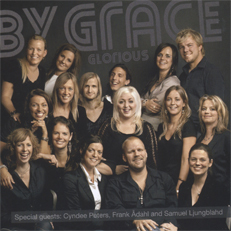 By Grace is 17 singers from Stockholm, Sweden, performing Traditional and Contemporary Gospel Music. The group, which frequently tours Europe and the US, has released four albums and performs regularly in Centrumkyrkan Evangelical Church, north of Stockholm. Director Mr Daniel Stenbaek is one of Sweden’s leading pianists. Daniel has been a frequent guest at some of the leading Gospel festivals in Europe and regularly performs with acclaimed Swedish and international Gospel artists. The essence of By Grace is conveyed in Ephesians 2:8-9: “For by grace you have been saved through faith; and that not of yourselves, it is the gift of God.” All members of By Grace share this notion and strive to express His Grace through the music and lyrics performed. By Grace has released four albums, the latest one entitled “Glorious” (2006). Previous albums include “The Best Is Yet To Come” (2005), “Alive and Satisfied” (1996) and “Live – featuring Rev. Daryl Coley” (1997).